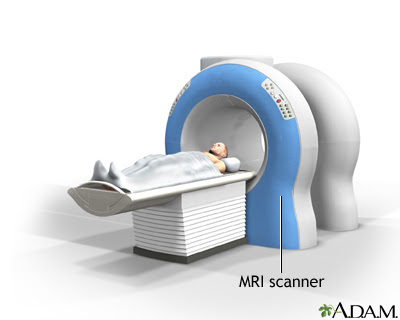 Magnetic Resonance Imaging (MRI) is an imaging application mostly for medical purposes. MRI uses powerful magnets and radio waves to construct an internal image of the target. It is also known as a Nuclear Magnetic Resonance Imaging (NMRO) or Magnetic Resonance Tomography (MRT). Unlike an X-Ray where ionizing radiation is bombarded to create an image, a magnetic field is utilized to build and visualize the internal structures in detail. This is done by having the target or subject lie down within a large powerful magnet. The magnet's magnetic field is used to align the magnetic properties (magnetization) of some atomic nuclei in the body. Radio frequency fields are then used to alter the alignment of this magnetization. The affected nuclei then produces a rotating magnetic field that is detectable by the scanner which then uses the data to form an image. The magnetic field can be adjusted to construct 2 dimensional or 3 dimensional images. MRI is a handy tool to safely image a human brain since the brain may be sensitive to other imaging techniques. Aside from constructing a brain image, it can also pick up neural activity within the brain. Tiny magnetic particles may help doctors track cells in the body to better determine if treatments work, according to research reported in Circulation: Cardiovascular Imaging, an American Heart Association journal. Researchers showed that injecting immune cells containing magnetic particles into the bloodstream was safe and did not interfere with cell function. Magnetic resonance imaging (MRI) scans can then track the cells moving through the body. "This could change how we assess new treatments affecting inflammation and the outcome of a heart attack or heart failure," said Jennifer Richards, M.D., lead author and vascular surgeon at the University of Edinburgh's Centre for Cardiovascular Science in Scotland. With stem cell therapy, doctors can adapt blood cells to fight disease. But when developing these therapies, it's hard to tell exactly where cells go and how many go where they are supposed to. Safely tracking them would help scientists better understand how new therapies combat heart disease. Other tracing methods expose patients to excess radiation or only allow cells to be tracked for a few hours. But MRI scans use no radiation, and cells containing the particles can be monitored for at least a week. Using test tubes, Richards' team first determined that magnetically labeled blood cells move and thrive like normal ones. Six people were successfully given three thigh muscle injections of unlabeled cells, magnetically labeled cells, and an injection of just the magnetic material. The labeled cells were traceable up to seven days later. Two people were given six increasingly larger doses of magnetically labeled blood cells through a vein, and they had no negative effects. 12 people got intravenous injections of the labeled blood cells – six getting a high dose and six a low dose – which were traceable by MRI a week later. To test how well the cells travel to inflammation sites, one person was injected with the labeled blood cells, which were successfully followed by an MRI as the cells moved to an inflamed area of skin on the thigh. "This demonstrates that this method may be useful to facilitate the development of cell-based therapies in the future," Richards said. Richards said more human tests are needed before researchers can regularly use magnetically labeled cells.